I don't think we ever saw the Nile (except crossing it in Cairo) even though we were always following its path southward. We saw trenches of water for irrigation all along the ride. 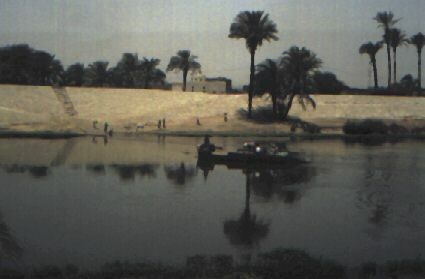 There were huts and donkey carts and marshy green and brown fields dotted with palm trees. Sometimes, we would pass small, poor cities and high, sandy/rocky cliffs. We didn't really see desert, but it was obvious that desert was out there within a few miles. The train ride was long - about 10 hours - and we were a bit restless. You certainly couldn't rest in the restroom. The pile of poop in there was inches from the seat by trip's end. Hardy T-weeds had a difficult time just doing a #1 in there. We slept a little here and there. We watched the food and soda sellers go up and down isles (we brought our own). Some played cards. We were in Luxor about 5:30 and were immediately accosted by dozens of hotel proponents. The handy "Let's Go" had already helped us decide on Everest and we were led through Luxor in the blazing heat by an employee. The 3 minute walk opened us to a city similar and unlike Cairo. It was far less busy, but had the same proportion of people trying to sell you stuff. "Excuse me, sir? English? Come inside - I show you chess board for only 60 pounds" "Excuse me, five pound! all alabaster." "Welcome to Luxor. Would you like a shirt? My mother made it." etc, etc, etc. The hotel was nice and cheap. We had A/C and 6 beds in 2 rooms for 100 pounds for 2 nights (about 3 bucks a night a person). Nice bathrooms in each room. The manager set us up with student ID's and a nice restaurant. The bubbling T-weed problems flared up as we left the hotel to get $, food, and Hurgada/Sharm info. We will try to keep the log as optimistic as possible, so I'll be brief and vague: there are indeed problems traveling with a gaggle of 6 - especially putting people together who have never lived together before. After the gaggle split and re-joined, we ate, avoided talking of controversy, and hit the hay. The El Houda restaurant served a bit of everything - we spent about $5-6 a head. I tried the pigeon (it came with head and all) which was OK but had very little meat. We spoke of how to rate girls on the 10 scale of looks and the personality type analyzer. 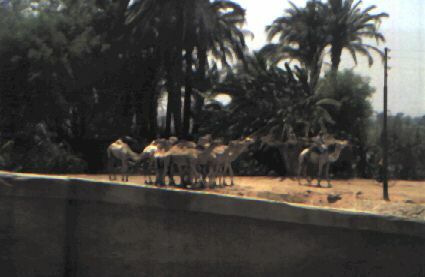 It was agreed to see the west bank of Luxor the next day but mode of transport was left undecided. Watch alarms would beep at 5:15.